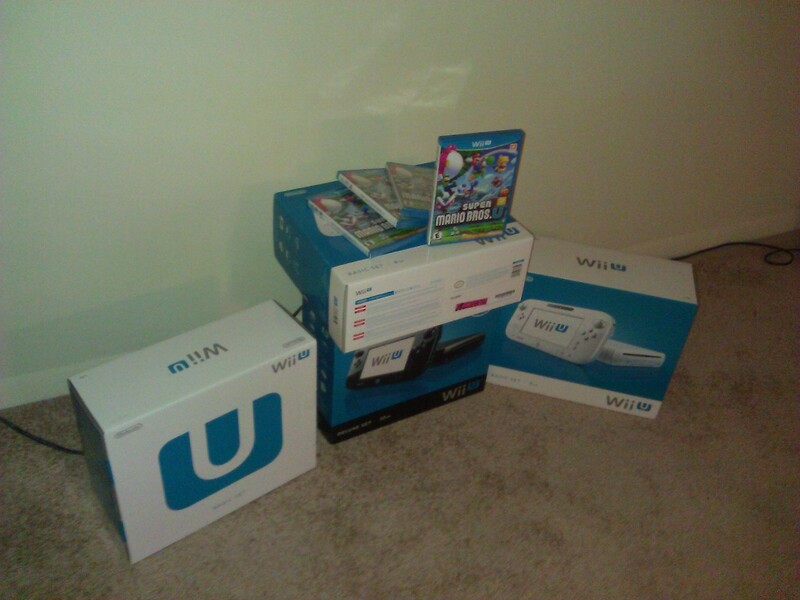 So you went out, and you bought a Nintendo Wii U, and maybe you’re going to surprise the kids on Christmas morning. Here are a few things you should know to Make Christmas go smoothly. There is an update the first time you use the Wii U. Not everyone in the world is going to take their new Wii U console online the first time they turn it on. But it is developed to be connected up to your home WiFi network and used over the internet. This allows a lot of cool interaction with other players online, but is still relatively “safe” like Nintendo’s last console, while affording the convenience of usernames like Xbox Live or Sony’s PlayStation Network. But you should know that the first time you turn on the console, if you connect it to the WiFi, there is going to be a system update to download. Rumors have capped this thing at 5 GB. While I think that realistically it comes in somewhere in the neighborhood of 2GB, I believe there was an unexpected rush of people downloading the update on the November 18th “launch day” and that caused the downloads to take upwards of two hours, and depending on your connection speed, who knows how long it could take. This will undoubtedly happen again on Christmas day. By the time the update was done, my Gamepad that comes partially charged out of the box, was dead, and I couldn’t play any games! ProTip: If you’re going to give this to your kids on Christmas, unbox it and hook it up the night before. Download the update, get it out of the way. Wrap the box in wrapping paper so your kid can have that Christmas morning experience they all want, but then hand them the gamepad and have it set up, updated, and ready to go! In a few months, this part of the article won’t matter, as the update will come “baked in” to the console, but every one being opened up in 2012 is going to suffer this fate. And Nintendo is very clear to let you know that unplugging the console or interrupting the download could damage the Wii U.
You’re going to need TWO power outlets. That’s right, the Wii U comes with two small power bricks. While one is bigger than the Wii U, neither is quite as big as the Xbox 360’s power brick. One is for the console itself, and the other is for charging the game pad. On that topic, you can plug the charging cable in to the Gamepad, so that you can charge and play at the same time, or into the charging dock. Although it looks like Micro USB, it’s not quite the same, so right now you can’t just go out and buy a replacement cable. The charging dock doesn’t need to be near the Wii U console, in fact it could be in an entirely different room of the house, but you will need to charge the Gamepad periodically. Why are there two stands included? What’s with the rubber “U” shaped things? If you bought the Deluxe model, you get a charging for the gamepad, and another stand you can rest the controller in. Why two different places to rest the Gamepad? The stand serves multiple purposes. The idea is that some games may want you to rest the controller somewhere briefly – no need to put it on the charging stand, as constantly charging then taking the controller of the charger can lead to shorter battery life over time. Also, it allows you to keep the stand near the Wii U, or somewhere in the living room, while the charging dock with a power cable running to it could be conveniently tucked away elsewhere. The Deluxe model also includes a couple of rubber feet that can be conveniently shoved on to the “side” of the Wii U console to act as balancers when standing it veritcally, so that it looks like the original Wii in most of its promotional shots. I prefer to leave my console laying flat, traditional style. The picture above shows the Gamepad resting in the unpowered stand, the two rubber feet for the console, and the charging stand flipped upside down to reveal where you place the power cord. If you have a Nintendo Wii already, the Wii U can be sync’d up with those Wii Remote controllers. If you don’t have any, buy at least one. It’ll come in handy for several reasons. 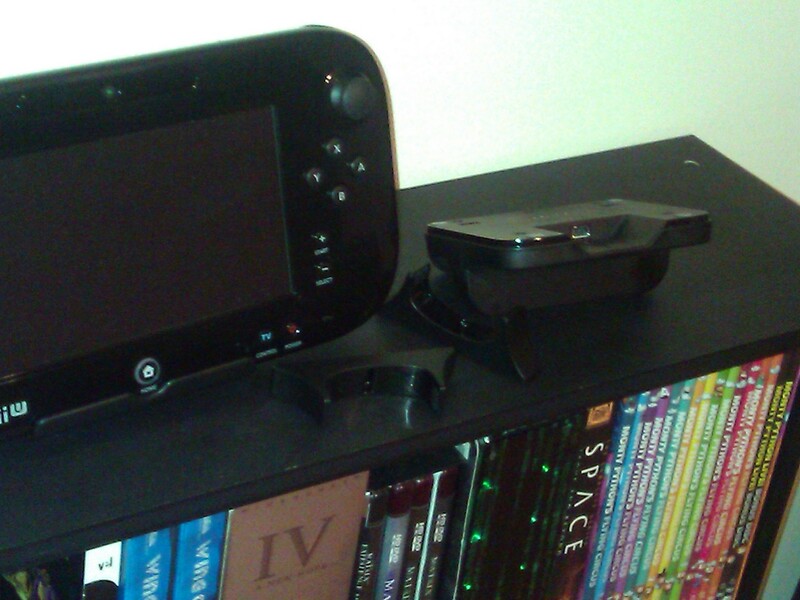 Did you know the Wii U has, essentially, a Wii built in? Yeah, you can boot right in to “Wii” mode, and it looks just like you’re on the Wii! Players 2 and beyond use Wii Remotes, while Player 1 gets the Gamepad. Kids are going to fight over who gets to be the one holding the pad. It’s inevitable. One wants what the other has. The good news is that the games are actually fun for multiple players to trade back and forth. Heck, mom could be the one with the Gamepad, while little Sammy and Jamie (like how I made the names androgynous?) use Wii Remotes. You can even add another Wii remote so dad, or other mom (because we love and support all forms of family this holiday season) can join in the gaming fun! My eBay auctions all include a copy of New Super Mario Bros. U . The Deluxe model (black) Wii U includes the game NintendoLand, but every kid opening the Wii U in December wants to play a crisp new Mario game. There’s something just right with the world when Mario is saving the princess while you’re on vacation from school. Don’t bother with Child Accounts. Do you think your kids are rotten little devils? No? Good. Then don’t waste your time with Child accounts. To create a child account, you must first create a parent account, then register a credit card, and register each child account for fifty cents each. The only real benefit is to lock them out from playing certain titles, seeing certain content, and other things the existing parental controls should be able to do on the console locally. And if not? Trust your kids. Watch what they’re playing and raise them right, they’ll turn out just fine. Registering them as a child account also prevents them from buying games on your credit card from the Nintendo eShop, but here’s the kicker: to register an adult account, you don’t even need to add a credit card. Not that they don’t charge it, you don’t even need it! Got all of that? Good, now get on the Miiverse and add NuAngel as your friend! Sprint tries to enter… the meme market? What is the Miiverse on the Wii U? See for yourself!